Debra Goldman was featured in an online article at Gym Source. ” At Gym Source, we appreciate the importance of personal trainers. That’s why we regularly spotlight local trainers making a big impact on their clients’ well-being. 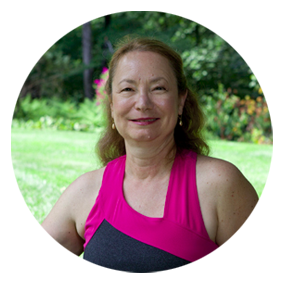 This month, we’re happy to feature Debra Goldman of Pilates Works, Inc. in Wayland, MA. Meet Deb here, and see how her unique combination of strength training, cardio and functional fitness keeps her clients healthy over the long term. GS: What services does Pilates Works provide to clients? Debra: Pilates Works has something for everyone! We offer Stott Pilates together with strength training and physical therapy—most notably using our two Power Plates, an Octane seated elliptical, and other cardio machines like a treadmill and recumbent bike. The studio is open Monday through Saturday. Best of all, you can’t beat the view! My private 1,100 square-foot studio has tons of windows and overlooks 1.5 acres of beautifully landscaped and wooded grounds. GS: What got you interested in fitness? Debra: I grew up on the North Shore and began my ballet training at the age of two. When I had a kidney removed—cutting short my ballet career with Boston Ballet II—I was told I could no longer pursue a physically active lifestyle. But after a few years of physical inactivity, I joined a gym in 1980 and began lifting weights with the guys! I competed as a bodybuilder in my twenties, and became one of the first personal trainers in Massachusetts at age 23. I’ve been doing it ever since. GS: Why (and how) did you become a personal trainer? Debra: Having reshaped my own body and improved my health through exercise, I knew that becoming a personal trainer was a perfect fit for me. I spent 19 years seeing clients in my home. As a single parent I needed to work, and wanted to be home for my son after school. Sixteen years ago when I moved to Wayland, I set up my own Pilates studio, and from there Pilates Works was born. GS: What do you love most about being a personal trainer? Debra: I love my work! I see myself as the bridge between fitness and medicine. I work with clients with an array of health conditions: from arthritis to cancer, from young to old and everything in-between. It’s enormously satisfying to impact someone’s life so positively. I have one client who’s been coming for 15+ years, and who was morbidly obese when I met her. She hated to exercise, had orthopedic pain, was a breast cancer survivor and didn’t know where her body ended and the rest of the world began. Today, she’s in better shape than ever. She’s maintained a good weight, and has exercised her way through another bout of breast cancer, shoulder surgery and the aches and pains of aging. GS: What’s your secret to motivating clients? Debra: It’s listening to them. I ask questions before our session: Are your tired, hungry, stressed, in pain? Their answers help determine our regimen. Overall, my philosophy is one of functional fitness; I want to help someone gain and then maintain the function of their body through a lifetime, and to assist them in maintaining an independent life. My oldest client is 90; we work hard together to address her pain issues and keep her driving and living independently. GS: What’s your favorite fitness equipment, and why? Debra: My favorite machine is the Power Plate. I can’t say enough about whole body vibration! I’ve healed fractures, reversed osteoporosis, managed pain, increased flexibility, strength, tone, and more on this incredible piece of equipment. In the 10 years I’ve used Power Plate, I believe it’s the greatest technology to happen to fitness, PT and rehab—ever. Plus, my clients love it, too! GS: How has the fitness industry changed since you’ve become a trainer? Debra: When I started out 35 years ago—lifting weights with the guys at the gym—there were no other women doing strength training. And the equipment was completely different. It’s been only 20 years since the first elliptical was introduced—now we have lateral and seated ellipticals! There were no recumbent bikes back in the day, and no indoor cycling or yoga, and Pilates in Manhattan only. We’ve come a long way, baby! I’m excited for the future. GS: How has Gym Source helped your business grow?